Author/Creator : Nicholas Kory, all credits goes to him. I’m so amazed and impressed with this campaign and its artwork, that I ‘m planning to share it with my French players, and therefore kindly ask you if it would be possible to share the files in order to translate them ? Thanks in advance for your response, keep up with your work. Good campaign overall. I’d say I struggled a bit to finish it and that’s a good thing. Altough after strolling through it for so long I kind of got sick of the fire 🙂 That’s also a good thing I guess. Second scenarios is really marvelous IMO. This looks like an awesome scenario. What is the best way to print this? It seems that the front and back of the cards are next to each other instead of on a separate sheet that would allow for double-sided printing. They’re arranged in such a way to be printed, cut, and folded along the long edges. 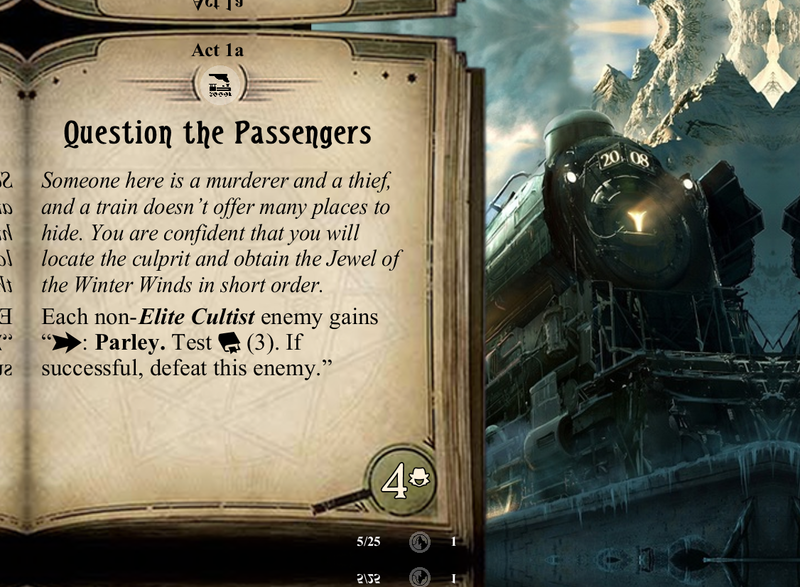 What are the Dark Cult encounter cards for Frozen Tracks? Encounter set symbols would be helpful for organizing Encounter Decks. So far the cards look very good and we can’t wait to try out the first scenario. Dark Cult is an encounter set included in the core set of Arkham Horror. Yeah, I produced scenarios 1 and 2 before I learned how to integrate set images into the setup cards. Apologies! That is fixed by scenario 3. In Stranded in the Urals, what is Pursuit? 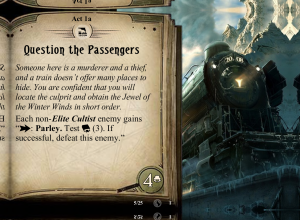 I can’t seem to find this encounter card. Pursuit is the encounter set with the three angled claws as a set symbol. There should be seven cards in that set, I believe. What Expansion or game box was Pursuit in? I don’t seem to find the symbol for some reason. It’s part of the Stranded in the Urals download. Includes Mysterious Predator, Signs of the Beast, and other related cards. Could you include a list of what the new icon names are. I don’t know how people are putting their Encounter Decks together without knowing what set the icons represent. Yeah, I’ll update the scenario 3 file with a reference card. That should make everything easier. Sorry about the confusion. Alas, the lower resolution used for scenario 3 seems not appropriate for printing – any chance you could provide the images with bleed in the same resolution you used before? I realized this as well. I’ll see if I can get high res images up within the week. Thanks for the reminder! Any updates on that high resolution version? I was hoping to print this online. Thanks! Thanks for letting us know! It’s a pitty as a player, but congrats! Just started with a friend on the campaign and must say, very very well done. I really enjoyed the first scenario and looking forward to continue playing it. Please please finish the campaigne! Hello. Great campaign, I have played only the fist part, yet. Will there be more chapters coming or is it finished?